The hummus and falafel wars have been going on for years now – a basically endless (and usually groan-worthy, if you ask me) back-and forth hinging on authenticity and less-than useful reductionist categories that can never really be resolved because they aren’t really designed to be. This post isn’t about that. It’s about a chickpea dip from the haute cuisine of Abbasid Baghdad, as featured in Lilia Zaouali’s book Medieval Cuisine of the Islamic World. The book offers an overview of the cuisine and cookbooks of the ninth and tenth century courts of the Abbasid caliphs, along with a treasure trove of actual recipes – many of which are worth attempting today. 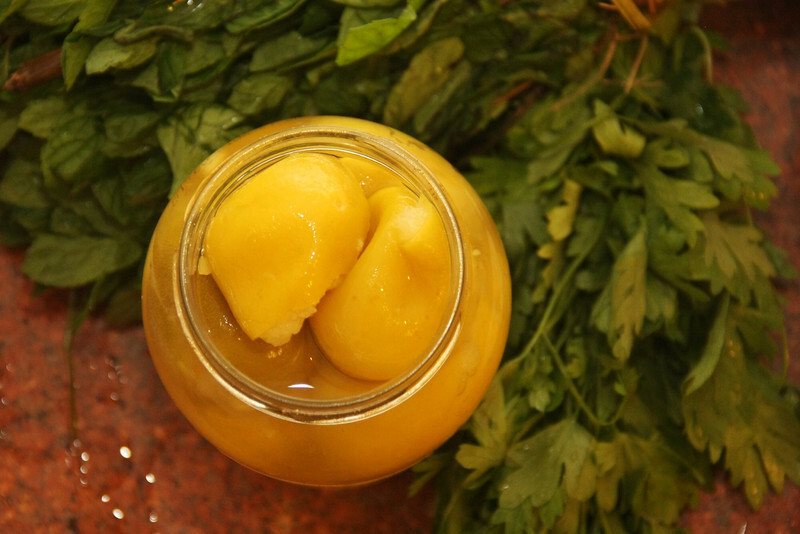 This one is adapted from the book’s “Puree of Chickpeas with Cinnamon and Ginger:” a hummus without tahini, essentially, and with some additions: fresh parsley and mint, on one hand, and cinnamon and ginger, on the other. Its tang comes not from lemon juice, like modern-day hummus, but from red wine vinegar – a sharp taste that’s surprisingly well moderated by the addition of the cinnamon and the ginger, even as it reigns them in and keeps the dish properly savory. If you (like me) are not the greatest tahini fan in the world, or you like to add a little color to your mezze, this recipe is for you. 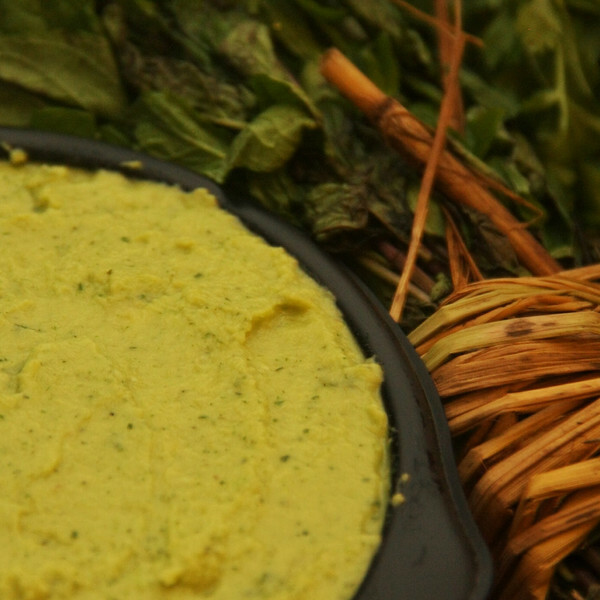 No-Sesame (Green) Hummus, adapted from Lilia Zaouali’s Medieval Cuisine of the Islamic World. Now, the original recipe calls for no lemon juice, but I added some because I love it so much with chickpeas. It also calls for adding the spiced chickpeas to a dish that already has the chopped herbs on it – then topping the whole thing with olive oil. I’ve thrown it all in the blender in the interests of convenience and stashing my food for later, but if I were thinking through a presentation for a dinner I might keep more to the original instructions. 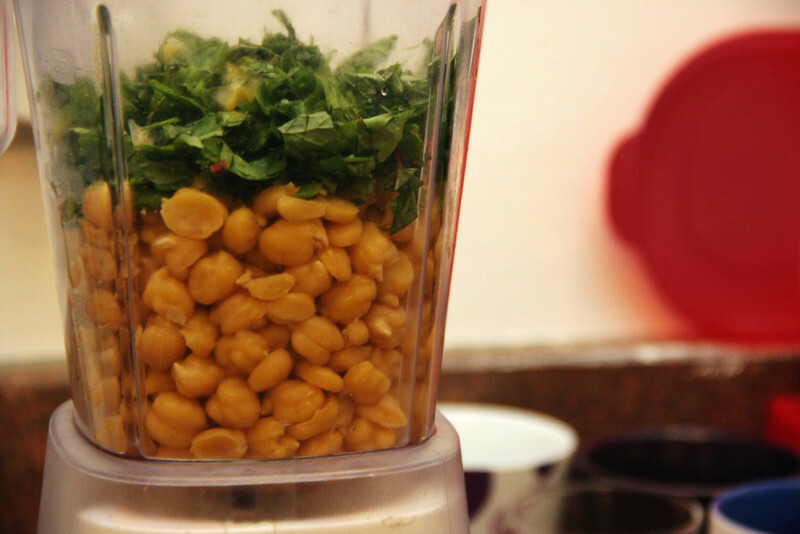 My suggestion is to add the chickpeas, herbs, lemon, and half your liquid mixture to the blender, along with just enough water to get the chickpeas started blending. Then add in water and the oil/vinegar/lemon juice mixture a bit at a time – alternating about a half cup of each, in turns – until everything blends together smoothly. I also tossed in a bit of reserved liquid from my jar of preserved lemons for some extra lemony salty flavor. The great thing about this method is that because preserved lemons are so salty, you shouldn’t have to mess with adjusting the salt content of your hummus – which can be tricky otherwise. My very last move was to mix in the spices – I think I waited till the end because of my reservations about using cinnamon and ginger, which turned out to be totally unfounded. You’ll want to add more than you think – start with a tablespoon of the cinnamon and ginger, plus the pepper, and keep mixing and testing until you feel it’s reached the right balance. When the vinegar, cinnamon, and ginger balance one another out just right, you’ll have just the faintest whiff of each, without tasting too much of any one of them. More photos here! If you liked this post, like the Facebook page or follow me on Pinterest for more photos / updates / recipe ideas.